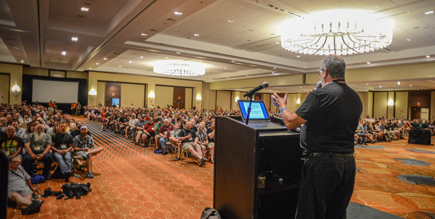 Tom Peters stood before a packed house of homebrewers, and as he began delivering the keynote address, you could hear the jaws hitting the floor. It’s staggering that one man has had such a profound effect on city of 1.5 million people, but he’s done just that in Philadelphia. The story began with Tom’s first trip to Belgium in 1984. He walked into a Brussels bar and ordered a Heineken. As he finished, a kind bartender asked him if he’d like to try a real beer, and that’s how Peters ordered his first glass of Duvel. Although he was initially put off by the beer’s voluminous head, he soon experienced “His Belgian Epiphany.” Then, he sampled Orval and Chimay Blue, and not surprisingly, he tore up a train ticket to Paris and stayed in Brussels. Once he returned to the U.S., Peters convinced his manager at a Cajun restaurant to order a case of Chimay. Although the patrons fell in love with the beer, he quickly realized he’d made a huge mistake—”I forgot set aside a bottle for myself!” Since then, Tom’s diligently sampled his wares for… you know… quality control. Indeed, Peters has done his part with Monk’s Cafe, but he isn’t content to simply serve great beer. He takes care of his employees, bringing a massage therapist by the bar twice a week to soothe sore backs or shoulders. Tom also cares for his community, holding charity events to benefit Alice’s Lemonade Stand, a foundation for childhood cancer. At one event, Monk’s tapped Pliny the Younger and raised $15,000 in one afternoon. Russian River Brewing Company was so pleased that they chipped in another $5,000 to make it an even 20 grand for the charity. 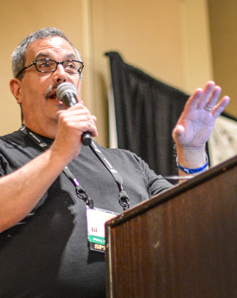 As he wrapped up his address, Tom admired the homebrewers’ passion: “After coming to this event, I want to start homebrewing myself—like I need another addiction!” he joked. Hopefully we’ll see him at another National Homebrewers Conference in the years to come, as an attendee.